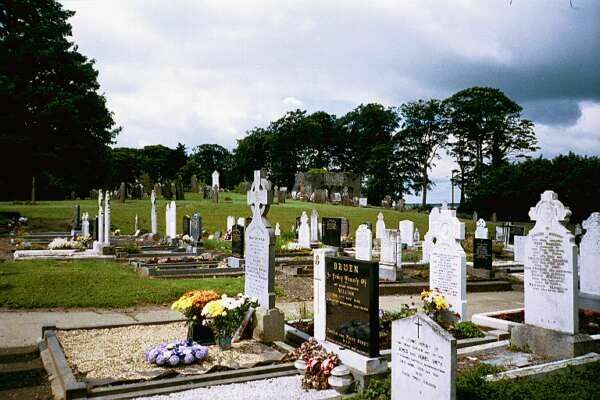 Mulhuddart Cemetery is among the oldest cemeteries in Ireland still in use, with gravemarkers going back to the 1300s. The cemetery grew slowly around the grounds of the Church of Mary. The ruins of the church are still inside the cemetery. The church goes back to the 1400s, when in 1445 King Henry VI of England granted a licence for the founding of a guild or society of the Blessed Virgin Mary at Mulhuddart. The church, however, was not built in 1445, and it's not known exactly when it was. However, records show that mass had been said in the church before the Catholic Reformation of the 1500s. After the Reformation, the Catholic mass was forbidden in the church. When exactly the church fell into disrepair, is not known either. Other records show that the building was in excellent condition as late as 1615. But by 1630, the building had fallen into disrepair, likely due to the low numbers of Christians available to keep it going. Once the church was abandoned, Catholics began using the cemetery again, along side with Christians. However, because most Catholics could not afford tombstones, they remain unmarked in Mulhuddart Cemetery. Today, Mulhuddart Cemetery is administered by the Fingal County Council.